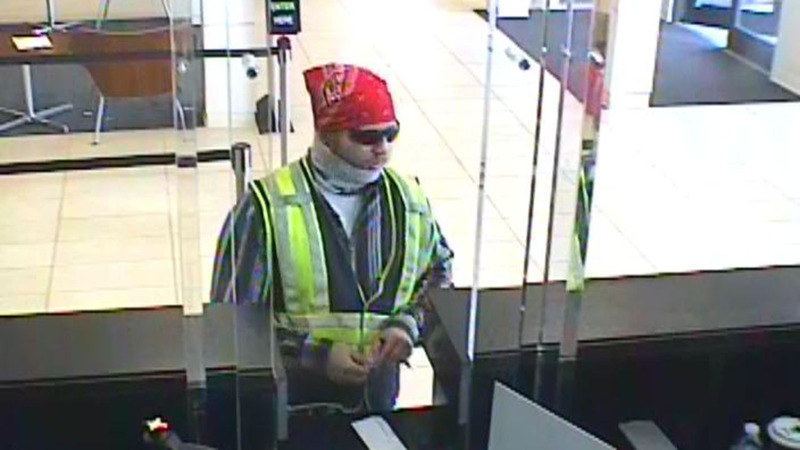 HOUSTON (KTRK) -- The FBI Violent Crime Task Force is asking the public's help in finding a bank robber who disguised himself as a construction worker. Officials say the robber threatened tellers on July 22 at the Capital One Bank on North Braeswood Boulevard with a note demanding money. According to witnesses inside the bank, he also claimed he had a weapon. The robber left the bank with an undisclosed amount of cash. The suspect is described as a white male in his 30s, 5'11"-6'0" tall and 200 pounds. Workers also said he had red hair, a red beard and wearing a yellow construction vest, red flannel button-down shirt, jeans and construction boots. Crime Stoppers of Houston is offering up to $5,000 reward for information leading to an arrest. If you have information, call (713) 222-TIPS or contact the FBI Houston Field Office at (713) 693-5000.